The Lake Tahoe Scenic Drive is a beautiful paved drive that makes a 68 mile loop around Lake Tahoe in California and Nevada. The route follows three paved highways: US 50, NV 28 and US 89. Along the way, the scenic drive passes through the nice and popular towns of South Lake Tahoe, Tahoe City, Incline Village, King’s Beach and several other small towns. Lake Tahoe is one of the premiere tourist destinations in both California and Nevada. Millions of people visit the Lake Tahoe Basin to take advantage of the superb hiking, excellent skiing, the lakes crystal clear waters and the beautiful lake and mountain scenery. Since the Lake Tahoe Scenic Drive is a loop, the drive can begin anywhere. The most popular places to begin the drive are in South Lake Tahoe, at the junction of US Highway 50 and US 89, or in Tahoe City, at the junction of US 89 and NV 28. Regardless of where the traveler begins the drive, anyone traveling the route will have superb views, numerous recreational opportunities, plenty of shopping and a huge variety of restaurants. The Lake Tahoe Scenic Drive doesn’t frequently follow the shoreline of the lake. Instead, the road is usually back and above from the shoreline – sometimes by just fifty yards, other times by a mile or more. However, there are many beautiful scenic pull-off points along the route that provide outstanding views of Lake Tahoe and the surrounding mountains. Additionally, there are several city parks on Lake Tahoe. 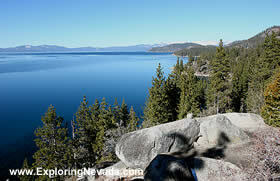 In particular, South Lake Tahoe and Tahoe City both have excellent public parks along the lake. There is no shortage of activities to keep a person occupied when driving around Lake Tahoe. Numerous hiking trails begin right along the drive. And the popular Tahoe Rim Hiking Trail can be reached either by taking a short side trip to one of the passes along the lake or by following a side trail up from one of the trailheads located along the scenic drive. Other excellent hiking options are found on the west shore of the lake, around Emerald Bay, where several trails lead down to the lake itself. Travelers who arrive in the winter will also find plenty to do away from their cars. The Tahoe Basin, as most know, is home to some of the finest ski resorts in the country. Heavenly Ski Resort, Squaw Valley, Diamond Peak, Northstar-at-Tahoe and several other ski areas are on or just off the scenic drive. The climate in the Lake Tahoe Basin is, in a word, gorgeous. The weather during the summer consists of seemingly endless sunny, warm days, with highs usually in the 80’s and nights dropping into the upper 30’s or 40’s. On occasion, temperatures can reach into the 90’s, but the dry air makes even warmer temperatures feel comfortable. During the winter months, highs in the Tahoe basin are generally in the thirties and forties, with lows in the teens. Winter weather consists of a mix of long, sunny weather periods, followed by large and often powerful storms that dump massive amounts of snow in the mountains and often down into the lower elevations around the lake as well. The traffic on the Lake Tahoe Scenic Drive varies considerably, depending on the time of year and the weather. During summer weekends, traffic is usually heavy, especially in the South Lake Tahoe area and on the north shore of the lake between Incline Village and Tahoe City. During the autumn traffic declines significantly, and during the weekdays traffic is generally moderate. The loop around Lake Tahoe is not open year-round. A short section of US Highway 89 along the west shore of Lake Tahoe on the California side, north of South Lake Tahoe near Emerald Bay, is closed during winter. The remainder of the road will always be open, weather permitting. 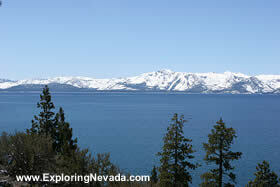 Overall, the Lake Tahoe Scenic Drive is a scenic drive that provides something for everyone. Unlike many scenic drives in Nevada, travelers will have much more to do than just to take in the sights due to all the development and activities available in the Lake Tahoe Basin. Trip Length : 68 miles, loop. The route follows three different highways as it makes a circle around Lake Tahoe. Road Type - The road is paved for its entire distance and in good condition. Services Available - Gas and supplies can be found in South Lake Tahoe, Tahoe City, Incline Village, King's Beach and many other locations along the route. General Location - Border of California and Nevada, just to the west of Reno. 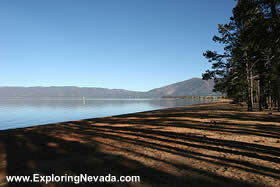 Camping - Numerous developed campgrounds exist all along the lake at the various California and Nevada State Parks. The Forest Service also has numerous developed campgrounds. It should be noted that finding "free camping" and/or primitive camp spots is difficult in the Lake Tahoe Basin. 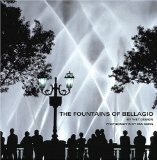 Hotels, vacation condos and other lodging are plentiful in the Lake Tahoe Basin. The cities of Reno, Carson City and Truckee also provide lodging options, too.